A visit to the vibrant state of Rajasthan draws many tourists and travellers from across the globe. The colourful culture, royal palaces, archaic forts, desert safaris and the gourmet cuisine are all an enriching experience that leaves you wanting more. Rajasthan most definitely makes it to the bucket list of travellers and backpackers. Chittorgarh is one such place that you must visit for the love of travel. Nestled on the banks of the Berach river, Chittorgarh was the former capital of the Rajput dynasty in the Mewar kingdom. The historical significance of Chittorgarh makes it a place of interest for historians and history enthusiasts. Some famous names etched on the pages of history, like Rana Sanga and Maharana Pratap belonged here. The most famous attraction of Chittorgarh is the Chittorgarh Fort, also called Chittor Fort-a UNESCO World Heritage Site. Known to be one of the largest forts of Rajasthan, this magnificent fort is a must visit while travelling to Chittorgarh. Along with the glorious palaces, gates, water tanks, Jain temples, towers and statues inside the Chittorgarh Fort, one place that unfailingly catches attention is the beautifully carved Meera Temple. Also read: 27 Must-Visit Forts in Rajasthan! The temple is dedicated to the Rajput princess Meera, famously known as Meera Bai who was an ardent devotee of Krishna and a mystic poet. Many legends and folklore tell the stories of the devotion and valour of this 16th-century Rajput princess who went on to become a renowned saint of India. The devotional poems written by Meera dedicated to Krishna are still talked about and studied by linguists and scholars. Popular legends about Meera Bai and her devotion narrate how blessed she was and how unshakable her faith and devotion was when she miraculously survived even after drinking a glass of poison sent by her in-laws, as they felt Meera's beliefs and behaviour were against religious and social conventions, which was especially unacceptable in a royal family. 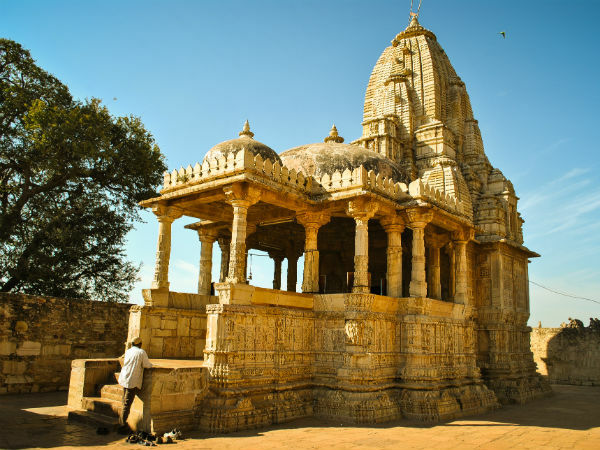 The ornate Meera Temple that stands inside the Chittorgarh Fort is constructed in an Indo-Aryan architectural style and was built by Rana Kumbha. The temple is attractive with its intricately carved walls and pillars and the pyramid-shaped pinnacle and showcases a fine work of architecture. It is also the only temple or structure that wasn't seized by the Ala-ud-din Khilji, the Sultan of Delhi who had rallied his forces against the kingdom of Mewar. To enjoy a travel to Rajasthan, it is best to plan the trip around the winter months through early spring between October and March. During the winter, the daytime temperature would be cool and pleasant, the nights, however, can get pretty cold especially in the desert. Also, the Chittorgarh Fort is open to visitors between 9.30 am to 6.30 pm. By road: Chittorgarh is well connected with the major cities of India. Private as well as government transport (Rajasthan Roadways) is available to reach Chittorgarh from Mumbai, Delhi, Ahmedabad, Ajmer, Udaipur, etc. By rail: The Chittorgarh railway station is the nearest railway station to reach the Chittorgarh Fort and the Meera Temple. The railway station is approximately 9 km away from the Chittorgarh Fort. By air: The nearest airport for Chittorgarh is at Udaipur, at a distance of approximately 100 km. You can hire a car or cab or board a bus from the airport to reach Chittorgarh.